According to GuruFocus' top holdings data, Chuck Royce (Trades, Portfolio)'s five largest positions as of the end of fourth-quarter 2018 were Quaker Chemical Corp. (KWR), Meredith Corp. (MDP), Vishay Intertechnology Inc. (VSH), Standard Motor Products Inc. (SMP) and Marcus & Millichap Inc. (MMI). Warning! GuruFocus has detected 5 Warning Sign with DNBF. Click here to check it out. The guru's New York-based firm, Royce & Associates, specializes in small-cap companies. It picks stocks based on an active, bottom-up, risk-conscious and fundamental approach, looking for value opportunities among companies trading at a discount to enterprise value. Royce is the keynote speaker for the 2019 GuruFocus Value Conference. 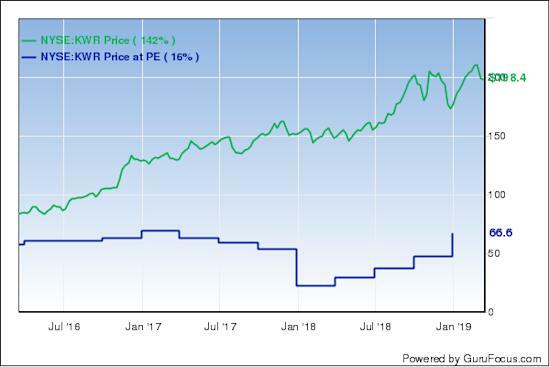 The investor's largest position is 713.137 shares of Quaker Chemical, representing 1.14% of the equity portfolio. GuruFocus estimates he has gained 37% on the investment since the third quarter of 2011. 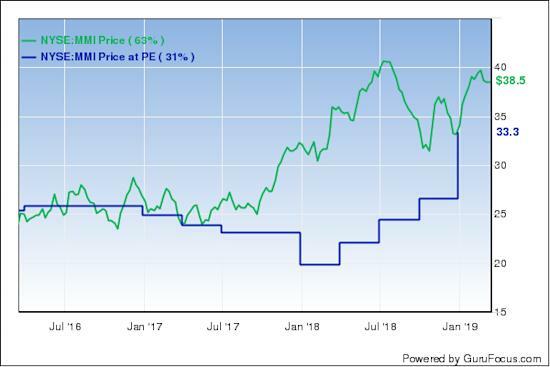 The Conshohocken, Pennsylvania-based chemical company has a $2.63 billion market cap and an enterprise value of $2.55 billion; its shares were trading around $197.25 on Thursday with a price-earnings ratio of 44.39, a price-book ratio of 6.07 and a price-sales ratio of 3.01. GuruFocus rated Quaker Chemical's financial strength 7 out of 10. In addition to having adequate interest coverage, the robust Altman Z-Score of 8.60 indicates the company is in good fiscal standing. The company's profitability and growth scored an 8 out of 10 rating, driven by operating margin expansion, consistent earnings and revenue growth and a high Piotroski F-Score of 8, which suggests business conditions are healthy. The company also has a business predictability rank of 2.5 out of five stars. GuruFocus says companies with this rank typically see their stocks gain an average of 7.3% per year. Of the gurus invested in Quaker, Royce has the largest holding with 5.35% of outstanding shares. Jim Simons (Trades, Portfolio)' Renaissance Technologies and Mario Gabelli (Trades, Portfolio) are also shareholders. Royce owns a 2.4 million-share stake in Meredith, which represents 1.10% of the equity portfolio. According to GuruFocus, he has gained an estimated 29% on the investment since the third quarter of 2010. The media conglomerate, which is headquartered in Des Moines, Iowa, has a market cap of $2.56 billion and a $5.52 billion enterprise value; its shares were trading around $56.73 on Thursday with a forward price-earnings ratio of 7.09, a price-book ratio of 2.44 and a price-sales ratio of 0.87. Meredith's financial strength was rated 4 out of 10 by GuruFocus. In addition to having weak interest coverage and poor earnings quality, the Altman Z-Score of 1.19 suggests the company is at risk of going bankrupt. The company's profitability and growth fared much better, scoring a 7 out of 10 rating on operating margin expansion, strong returns that outperform industry peers and a moderate Piotroski F-Score of 4, which indicates business conditions are stable. The company also has a one-star business predictability rank. According to GuruFocus, companies with this rank typically see their stocks gain an average of 1.1% per year. With 5.66% of outstanding shares, Barrow, Hanley, Mewhinney & Strauss is the company's largest guru shareholder. John Rogers (Trades, Portfolio), Michael Price (Trades, Portfolio), Gabelli, Pioneer Investments (Trades, Portfolio), Hotchkis & Wiley, Simons' firm and Joel Greenblatt (Trades, Portfolio) also own the stock. The guru holds 6.57 million shares of Vishay Intertechnology, which accounts for 1.06% of his equity portfolio. GuruFocus estimates he has gained 35% on the investment since third-quarter 2011. 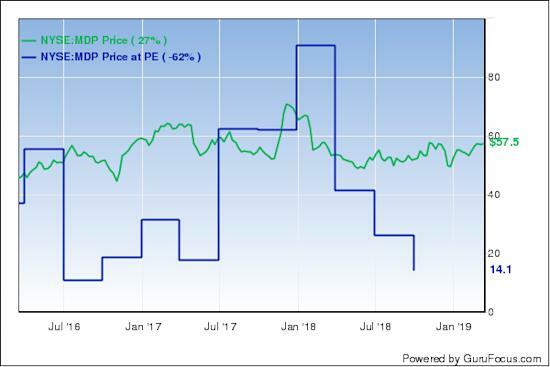 The Malvern, Pennsylvania-based company, which manufactures semiconductors and electronic components, has a $2.88 billion market cap and an enterprise value of $2.61 billion; its shares were trading around $19.95 on Thursday with a price-earnings ratio of 8.88, a price-book ratio of 2.06 and a price-sales ratio of 1.01. Vishay's financial strength and profitability and growth were both rated 7 out of 10 by GuruFocus. Although the company has sufficient interest coverage, the Altman Z-Score of 2.87 suggests it is under minor financial pressure. The company is also supported by an expanding operating margin that outperforms 73% of industry peers, a moderate Piotroski F-Score of 5 and a one-star business predictability rank. Royce is the company's largest guru shareholder with 4.56% of outstanding shares. Other top guru investors include Ken Fisher (Trades, Portfolio), Barrow, Hanley, Mewhinney & Strauss, Simons' firm, Greenblatt, Steven Cohen (Trades, Portfolio), Hotchkis & Wiley, Pioneer, Jeremy Grantham (Trades, Portfolio), Ray Dalio (Trades, Portfolio) and Paul Tudor Jones (Trades, Portfolio). Royce's fourth-largest holding is 2.19 million shares of Standard Motor Products, which has an equity portfolio weight of 0.95%. GuruFocus data indicates he has made an estimated gain of 43% on the investment since third-quarter 2011. 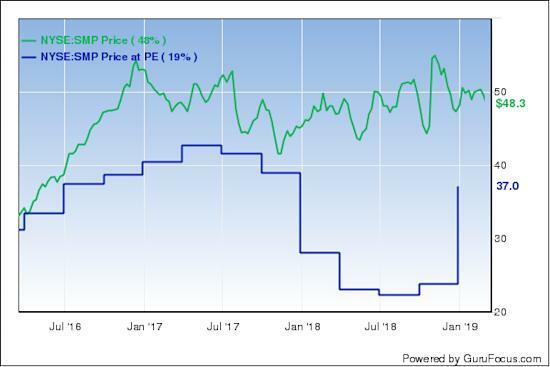 The auto parts manufacturer, which is based in New York, has a market cap of $1.08 billion and a $1.12 billion enterprise value; its shares were trading around $48.19 on Thursday with a price-earnings ratio of 25.77, a price-book ratio of 2.31 and a price-sales ratio of 0.99. Standard Motors' financial strength and profitability and growth were both rated 7 out of 10 by GuruFocus. Driven by strong interest coverage, the robust Altman Z-Score of 4.29 indicates the company is in good standing financially. Despite having a declining operating margin, the company is supported by strong returns that outperform competitors and a moderate Piotroski F-Score of 6. The one-star business predictability rank is on watch as a result of a slowdown in revenue per share growth over the last 12 months. With 9.78% of outstanding shares, Royce is the company's largest guru shareholder. Gabelli, Barrow, Hanley, Mewhinney & Strauss, Third Avenue Management (Trades, Portfolio), Hotchkis & Wiley, Jones, Greenblatt and Simons' firm also have positions in the stock. The investor has a 3.06 million-share stake in Marcus & Millichap, which accounts for 0.94% of the equity portfolio. According to GuruFocus, Royce has made an estimated gain of 35% on the investment since the first quarter of 2014. 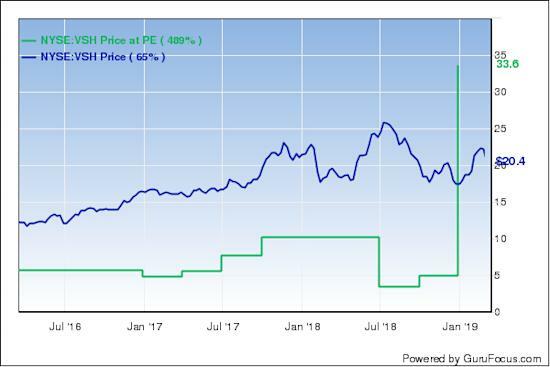 The Calabasas, California-based commercial real estate brokerage company has a $1.51 billion market cap and a $1.16 billion enterprise value; its shares were trading around $38.70 on Thursday with a price-earnings ratio of 17.45, a price-book ratio of 3.73 and a price-sales ratio of 1.88. Marcus & Millichap's financial strength and profitability and growth were both rated 8 out of 10 by GuruFocus. Boosted by comfortable interest coverage, the high Altman Z-Score of 9.19 suggests the company is financially healthy. The company is also supported by operating margin expansion, strong returns and a high Piotroski F-Score of 7. Of the gurus invested in the stock, Royce has the largest stake with 7.84% of outstanding shares. Other top guru investors are Simons' firm, Hotchkis & Wiley, Pioneer, Murray Stahl (Trades, Portfolio) and Greenblatt. Royce's other top holdings as of year-end 2018 were Lincoln Electric Holdings Inc. (LECO), Air Lease Corp. (AL), Hubbell Inc. (HUBB), Lindsay Corp. (LNN) and Ares Management Corp. (ARES). The firm's $11.15 billion equity portfolio, which is composed of 1,143 stocks, is largely invested in the industrial and technology sectors. According to its fact sheet, the Royce Premier Fund returned -10.4% in 2018, outperforming the Russell 2000's -11.01% return. As mentioned above, Royce will be the keynote speaker at the 2019 GuruFocus Value Conference in Omaha, Nebraska in May, joining Gabelli and Francisco Garcia Parames. The event will be held at the DoubleTree by Hilton Hotel Omaha Downtown. Reserve your spot by buying tickets today!